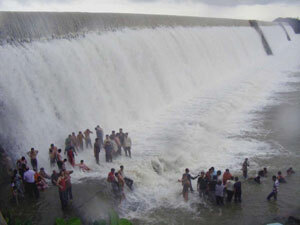 Gujarat Special: 45 Dams overflow ! Danger of serious flooding in 831 towns ! And it continues in Jamnagar and Kutch districts; Extraordinary ! 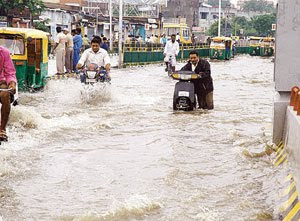 This is the only way I can describe the on going torrential onslaught there ! Another 24 hrs since yesterday's readings and we have added another,(all readings as on Tuesday 3rd Aug morning) 460 mms in Khambhalia, meaning 810 mms in 2 consecutive days ! (normal 604, total today 1662), 214 mms in Kalyanpur (Normal; 909, total today 1271), 1 90 mms in Lalpur (832 & 1315) and 158 mms in Dwarka (512 & 786). In Kutch (desert) another 177 mms have been added in Bachaau (367 & 634), 164 mms in Abdasa and 134 mms in Nakhatrana. Kutch district, which normally receives 395 mms in a complete season, has so far got 137 % of its full average ! And Jamnagar district as a whole has got 145% of its season's quota ! In other cities of Gujarat, there is Malia with 205 mms, Ranavav with 182 mms, Porbunder receiving 162 mms,Mangrol with 142 mms, Kaprada with 127 mms Veraval with 123 mms,and plenty to fill up a page with rains between 50-100 mms. Rajesh, you need to have a new poll on your blog now, the current one is beyond it's date now. 2. Will the Arabian Sea / BoB see a late monsoon cyclone? etc. Yes, you're right. And thanks for the "alert"
Good suggestions. I think I'll go in for the cyclone one, with a little change. nt, it did look threatening in the morning though. in fact the rain amount yesterday was 21 mms, just as er "vagaries" estimate of around 20 mms. C'mon, City always needs a break.